De Quervain’s tenosynovitis is an inflammatory condition that affects the lining of two of the thumb tendons. It causes pain at the bottom of the forearm at the thumb side of the wrist. There may also be a sense of stiffness or creaking related to thumb movements. As this condition is related to the thumb tendons, typically pain will be felt on activities that involve the hand and movements of the thumb and wrist and can be common in manual handling jobs. This can also affect people with more sedentary jobs who use a computer mouse for long periods. Symptoms can also occur during pregnancy and during the first year after childbirth, this is believed to be through a combination of hormonal changes and also changes in activity involved in looking after the newborn baby. Treatments such as non-steroidal anti-inflammatory medication (such as ibuprofen or naproxen), thumb & wrist splints and rest can sometimes be helpful. Exercises and stretching can also assist however sometimes the condition can progress to the extent that symptoms are too severe for these strategies to have significant effect. In these cases, steroid (corticosteroid/’cortisone’) injections can be a good option and can work very well in settling symptoms. Patient’s attending Life Fit Wellness Ultrasound Scan & Injection Clinic with this condition will first of all be fully assessed with a number of clinical tests. An ultrasound scan may also be performed to determine if specific tissue changes and local inflammation are present which helps to confirm the diagnosis and suitability for injection. Injections can be performed ultrasound-guided for improved accuracy. Following the injection the majority of patients will experience a significant reduction in their symptoms within just a few days. 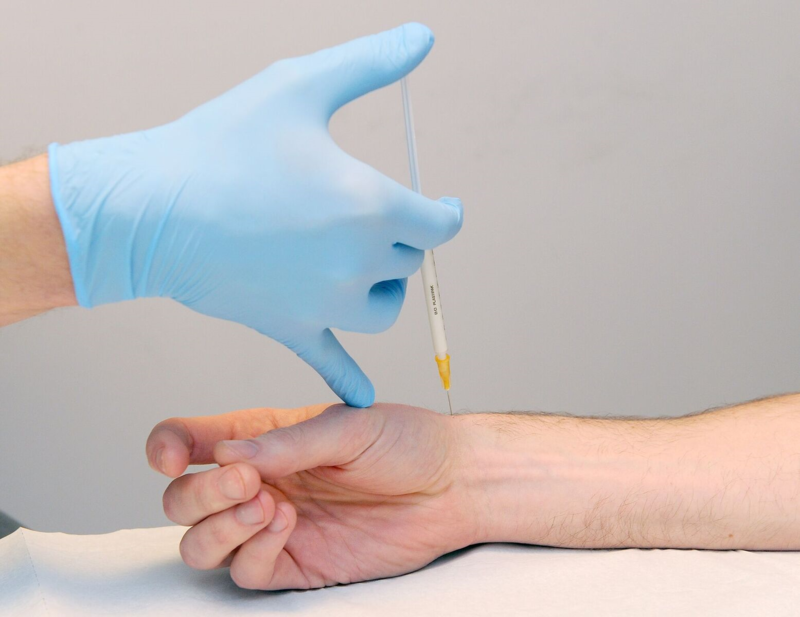 The effects of the injection can be maximised with the addition of specific exercises which is why the injection service being integrated into the Life Fit physiotherapy team provides the ideal solution. Please note that we do not offer injections for patients during pregnancy as the potential risks are unknown. We do offer this to patients who are breastfeeding as the British breastfeeding Association has confirmed that low dose steroid injections do not present a risk to the breastfeeding baby.